In our ever-connected world, business owners are finding themselves at the forefront a new threat: ransomware. Ransomware is a form of extortion. Often, hackers will access a connected business device and install malware, then demand payment to remove it which can be costly, and a gamble. Businesses of all sizes are being targeted, and small businesses may be more vulnerable since they often don’t have the security measures or training in place to defend themselves. 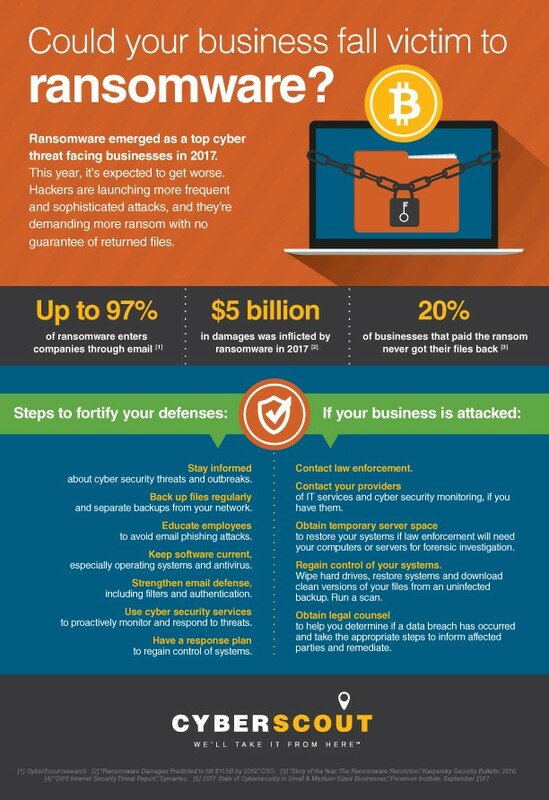 Learn more about business ransomware in the infographic below, and take steps to prevent it and prepare for it. The information in this article and infographic is for informational and suggestion purposes only. To learn more about Grange business cyber coverage, speak with your local independent agent. Cybercrime is a growing concern for businesses worldwide. And the cost of recovery can be significant. Learn five simple preventative measures that can help make your business safer and make life a little harder for cybercriminals. Cyberattacks target businesses of all sizes. In fact, 60% of small businesses close within six months of a data breach. Take action now to protect your business from cyber threats like data breaches, third-party data losses and ransomware.